When considering the discussion for reintroducing of senior specialist ranks to the US Army one must reflect on the trials and tribulations of the past. Here is a short history of the US Army Specialist by CSM (Ret.) Dan Elder. When Washington assumed the role as Commander in Chief of the fledgling Continental Army in 1775, it had adopted the British model of organization. There were basically four enlisted grades, sergeants, corporal, musicians and privates. The musicians were fifers and drummers, who directed the linear movements of Army formations. If the sergeants, corporals and privates were the combatants, it should not be a stretch to argue that those musicians were the Army’s first “specialists.” Though initially no special rank insignia signified enlisted soldiers of that era, Washington later directed that sergeants and corporals would wear epaulettes sewn on their right shoulder, red for sergeants and green for corporals. During the winter of 1776-1777, Washington ordered the establishment of three artillery regiments. In the Army’s 1967 comprehensive enlisted grade study it noted that, “Artillerymen were recognized as specialists from the start and were given higher pay than Infantryman.” It also noted a need for other “specialists” in the enlisted ranks to perform certain technical skills for the artillery. During this period service and support tasks were typically performed by civilians or detailed enlisted soldiers from the line. When Gen. Washington ordered the formation of three artillery regiments, he directed one regiment to be “artificers” to be employed in performing “essential specialist services” for the other two. 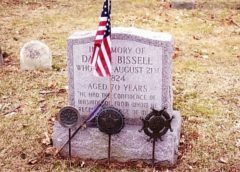 These men were to be later known as “enlisted men of Ordnance” instead of artillerymen. The artificers included carpenters, blacksmiths, wheelwrights, turners, tinmen, harness makers and farriers. In 1777 the Congress noted the need for a “slightly different organization” in providing a regiment of Cavalry. The regimental staff was organized with a saddler, and a trumpet major, and each company had a trumpeter and a farrier. The famous “Blue Book” by Baron Freidrich von Steuben, published in 1779, listed duties of many of the critical positions within the company and regiment, and included specific details on the “Quartermaster” sergeant. His duties included the “regimental baggage” and wagons on the march. By the War of 1812 the enlisted grade had remained the same since the Revolution. Besides the troops of the line, there were “groups of specialists” in fields such as medical, engineer, ordnance and quartermaster. It was then when special insignia and uniforms were authorized for specialists, who were formed into a Corps under the Quartermaster. Specialists normally received higher pay than their counterparts in the standard organization. In 1821 Gen. Winfield Scott introduced the first general regulation and established appointments for enlisted soldiers and noncommissioned officers, and included a new system of “distinguishing the various grades” of NCOs and specialists. This insignia replaced collar epaulettes with chevrons on the sleeves of the coat. In 1832 the Army established four specialist grades in the Ordnance department—-master workman, armorers, carriage makers and blacksmith, and laborers. Ordnance sergeants received higher pay and were allowed special insignia. During the Civil War a trend developed that was to fit the various specialists into the standard rank structure while preserving the special pay and allowances required, to draw men with these specialty skills. Thus, the pay scale was inflated and by War’s end in 1865, there were 29 enlisted categories, yet only eight types of insignia of grade, of which six were for NCOs of the line, the remaining two were hospital steward and pioneer. During the early portions of the 20th Century there was a noticeable uncontrolled proliferation of enlisted grades. By May 1908 the Army had 52 different ranks and titles and by 1916 there were 60. Of the different ranks, over 13% were specialists from the technical, administrative, scientific craftsmen and laborer fields. At the end of the first World War, Congress set out to improve the enlisted grade structure. In June 1920 it prescribed seven standard grades in which all enlisted men would be grouped and established a large number of specialist positions in lower grades that carried additional pay without additional rank. However there continued to be difficulty in identifying noncommissioned officers who were leaders and those who were senior specialists. This caused concern among the combat NCOs of the infantry and other arms. Also, in some cases privates with specialties could earn more than certain regular noncommissioned officers. This new structure remained in effect until the beginning of WWII. As the Army expanded for WWII a need for enlisted soldiers with specialized technical skills was apparent, mostly noted in the Army Air Corps. To simply the system, technicians were picked from various grades and given chevrons marked with a “T” in addition to their stripes. A technician ranked immediately below a noncom of the same rank, but ahead of a lesser noncom and technicians did not serve in a command role. The increase of technicians caused an inflation of the NCO ranks of WWII. This lasted until 1948, when the Army dropped the “T” designation and those holding that rank were appointed an NCO in the same grade. To recognize combat leader NCOs from technicians, the stripes were of different colors or backgrounds. The transition caused a lopsided structure between the number of privates and NCOs. Coupled with the top-heavy force and the reduced moral of the combat NCOs, who had earned their stripes over many years, those action had caused a perceived loss of prestige to them. 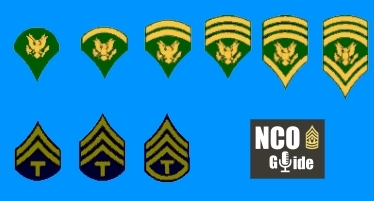 In 1951 all enlisted insignia were standardized to one color, further demoralizing combat leaders. The Army entered the Korean War with NCOs making up over 32% of the enlisted force. In 1953 a committee was formed to address the perceived decline in attractiveness of military service. It recognized that the military must “adopt policies to restore the prestige of noncommissioned officers” that would place a “premium on leadership and command abilities.” The committee also recommended that methods be developed to distinguish between command and technical responsibilities. The Army developed a program to separate specialists from NCOs, which gave birth to our current specialist system we now know. This program, which went in to effect 1 July 1955, grouped NCO grades E-4 to E- 7, which had a corresponding specialist position that mirrored it. These new specialists would wear distinctive insignia which is partially still in effect for the Specialist (E-4/SPC) of today. Noncoms had special considerations not afforded to specialists. These considerations were not to reduce specialist’s privileges, but augment privileges and prestige of NCOs. Leadership was the NCOs primary roles and so noted. Specialists received pay commensurate with his ability. In 1958 the DoD added two additional pay grades to give enlisted soldiers more opportunities to progress to a full career with additional opportunities for promotion. This included an addition of two specialist ranks at E-8 and E-9 and proficiency pay was incorporated into the pay scales. In 1968 when the Army added the rank of Command Sergeant Major, the specialist ranks at E-8 and E-9 were abolished without anyone ever being promoted to those levels. In 1978 the specialist rank at E-7 was discontinued and in 1985, the specialist ranks at E-5 and E-6 were discontinued. Today’s current rank structure only includes one specialist rank, that at E-4. The Specialist is in the normal career progression for enlisted soldiers in the path way going from an apprentice enlisted soldier, to the journeymen role associated with noncommissioned officers. There is no current method to identify senior enlisted specialists from those NCOs in a leadership position. Did the Spec 5 on active duty when that rank was eliminated the wear the 3 stripes of a Sargent E5? Yes, when the specialist ranks were dissolved in 1985 those who wore the rank of SP5 reverted to a 3-striper sergeant, the SP6 to the 3-stripes and a rocker staff sergeant.